Increase your workforce's chances of survival in an active shooter event. Businesses are vulnerable to the potential aftermath of a active shooter, aggressive intruder or mass shooting event. To meet OSHA’s General Duty Clause, each company should be prepared to protect their employees from potential workplace violence should they occur. ALICE Training provides you and your employees with strategic response protocols that are designed to help counter violent actions. Our training business program increases the chances of survival for your workplace and employees in addition to protecting your brand reputation and minimizing litigation fees and other fines. Whether you’re a small business or a Fortune 500 company – we’ve got you covered. Interactive training course for business leaders and employees to receive an individual certificate. Unsure which workplace violence, active shooter or mass shooting situation training option is right for you? 76% of Incidents Take place at a Business Location. The “it won’t happen here” mentality is so pervasive that many companies are ill-equipped to prevent workplace violence and unprepared to respond to a crisis. Many have no mass shooting prevention and intervention program, or have cobbled together some well-meaning (but misguided) policies. 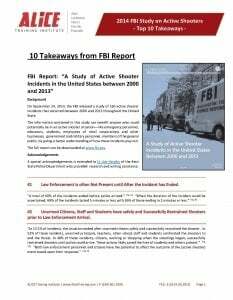 “Attacks at restricted commercial facilities, such as office building, factories and warehouses, occurred at approximately the same frequency as attacks at open commercial facilities such as retail stores or restaurants.” Combined, 76% of all incidents studied in the report took place somewhere other than schools. 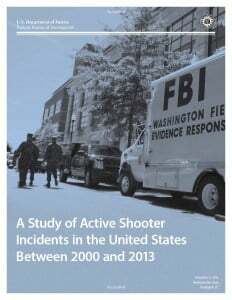 Source: NYPD “Active Shooter Recommendation and Analysis for Risk Mitigation, 2010 & 2012. Workplace Shootings Raise Awareness Among HR Managers. Certify your Staff as part of your Workplace Violence Program. 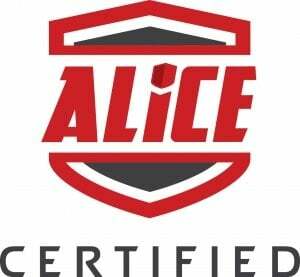 Organizations who understand the importance of ensuring safety during high impact events such as aggressive intruders or workplace shootings are using the ALICE certification training throughout their facilities. Protect yourself against OSHA’s General Duty Clause. All employers have a duty to provide their employees with a workplace free from recognized hazards likely to cause death or serious physical harm [General Duty Clause 5(a)(1) of the Occupational Safety & Health ACT]. Recent court rulings throughout the country have allowed negligence suits filed by victims of violent intruders and workplace shootings to proceed against employers for failing to provide defensive training to their employees. In other words, companies can no longer avoid their corporate responsibility to provide training on how to react if confronted by a violent intruder or mass shooting situation.